What They Say....Twenty-nine-year-old Sophie Diehl is happy toiling away as a criminal law associate at an old-line New England firm, where she very much appreciates that most of her clients are trapped behind bars. Everyone at Traynor, Hand knows she abhors face-to-face contact, but one week, with all the big partners out of town, Sophie is stuck handling the intake interview for the daughter of the firm’s most important client. Sophie, the whole affair will spark a hard look at her own relationships—with her parents, colleagues, friends, lovers, and, most important, herself. A rich, layered novel told entirely through personal correspondence, office memos, e-mails, articles, handwritten notes, and legal documents, The Divorce Papers offers a direct window into the lives of an entertaining cast of characters never shy about speaking their minds. 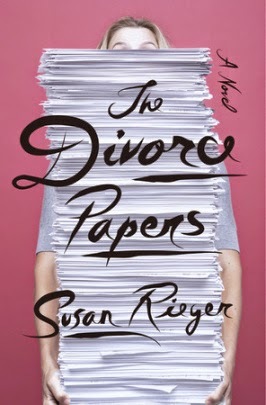 Original and captivating, Susan Rieger’s brilliantly conceived and expertly crafted debut races along with wit, heartache, and exceptional comedic timing, as it explores the complicated family dynamic that results when marriage fails—as well as the ever-present risks and coveted rewards of that thing called love. What I Say....I wanted to enjoy this book. And I may very well if it had been told in a different format. But all of the bills, contracts, intake forms, law books, and correspondence really took away from the story for me. I've always enjoyed the way Sophie Kinsella uses pieces of correspondence scattered thoughout her Shopaholic books, but the way it was done in The Divorce Papers was just too disconnected. I think it can work in a lighthearted way, but not when you are telling the story of a child who is having a breakdown about the thought of living with her father. It had promise, I think the story deserved to be told without committing so hard to the writing gimmick.